This September, 50 swimmers and 100 musicians are being sought after for a live performance project at Plymouth Sound. The event, which is part of Plymouth Art Weekender and in collaboration with The Atlantic Project, brings together wild swimmers and amateur musicians. 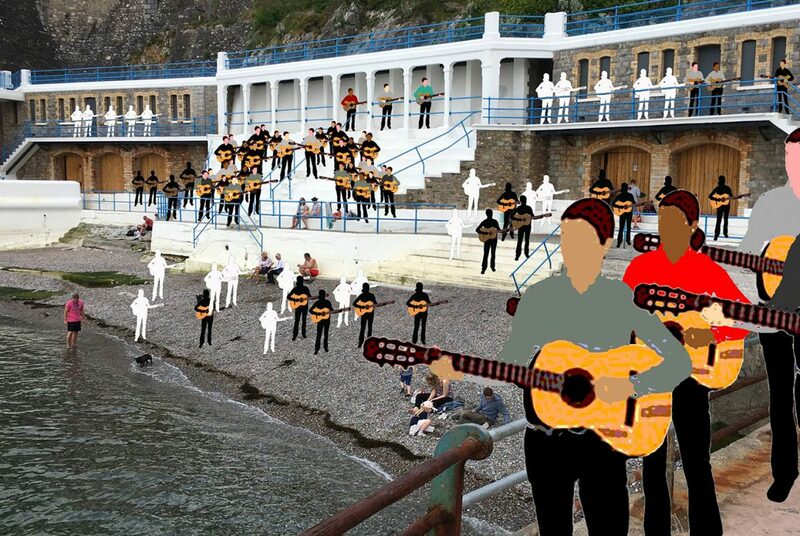 Immersive Orchestra will see participants enter Plymouth Sound to swim at their leisure while being accompanied by the Imperfect Orchestra’s ensemble of guitars. The swimmers will ‘conduct’ the performance of the guitar orchestra as their strokes in the water informs the pace of the music, the number of swimmers will affect the playing dynamics, so anyone who is a capable swimmer is being invited to take part. The piece is a collective project between South West artist Shannon Leah Watson and amateur music group, the Imperfect Orchestra. It will form part of the Plymouth Art Weekender, a three day event that takes place annually across the city. The Weekender celebrates Plymouth, its people and the visual arts, promoting the city as an exciting contemporary art destination. Swimmers will perform to a live score, Plymphony No.1 in Sea, which has been composed by the Imperfect Orchestra. There will be at least 100 guitars, or other stringed instruments from participants of all skill levels. Taking inspiration from swimming the piece will rely on rhythm, repetition, ebbs and flows. To take part as a swimmer or as a musician, visit Imperfect Orchestra and sign up or find them on Facebook. The event takes place on Sunday, 30 September from 12pm, more information and tickets can also be found online.